Yeah, obvious if you're a professional guitar repairer. Not so obvious if you're a novice musician. At a given pitch, the lighter the string, the lower the tension, and the more likely it is to buzz if hit hard. With a given string, the lower the pitch, the lower the tension. and the more like likely it is to buzz. 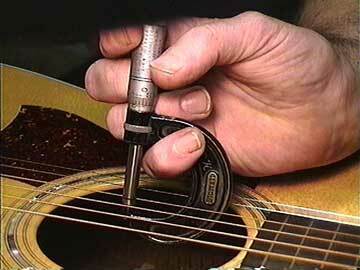 Most manufacturers label their strings with the exact gauges, and those labels are generally very accurate. But, sometimes, a string gets put in the wrong place. Every so often I accidentally put a second string in the first position and a first in the second position. The result is a very tight first string and a whopping buzz on the second! Usually the situation is nowhere near as gross. But it is important to realize that an instrument that plays buzz-free may not when it goes into alternate tunings, or when lighter strings are used. Some styles of playing just demand heavier strings, for example bottleneck blues or bluegrass backup flatpicking. In virtually all cases, moving to a heavier gauge will reduce buzzing, unless the action is already too high for adequate fretting. So, along with action and relief, string gauge is a really important consideration of proper individual instrument setup. After all, the instrument should be tailored as much as possible to the desires and abilities of the player.